Thursday nights are a little hectic on the home front. 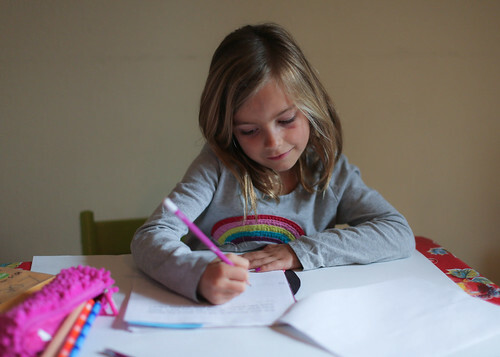 By the time the end of the week approaches we’re all fairly exhausted, so I tend to make an easy dinner or order take-out and we buckle down to make sure Zoe’s homework is completed. Zoe is very energetic, artistic, full of life and creativity, but this child does not dig homework. 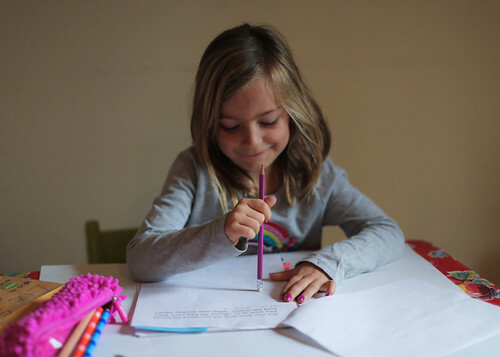 It’s sent me to the drawing board many times to figure out what will motivate her to get interested in completing her various pages of required school work at home. The differences between my children probably won’t ever cease to amaze me. When it comes to their personalities and preferences, Jack and Zoe couldn’t be more different. While Jack is reserved, often shy and thoughtful, Zoe is much more like me-she is inspired and motivated by impulses and surroundings. Her mind is constantly untethered. While these differences tend to complicate their relationship, in one way they are very complimentary, especially when it comes to school. Jack is eager to learn, he is organized, thorough and incredibly meticulous. He wants to excel and goes to great lengths to meet his goals and welcomes challenges with fervor. He is eager to help Zoe and motivate her to complete her homework, and we both really appreciate his companionship and help when it comes to spelling words and arithmetic. Otherwise, it’s been my main focus to find things to entice her to want to sit down and work, and with Zoe that often means fun supplies to work with. This is what Zoe would do all day every day, if she could. Zoe got a new bedroom design late last year, and as a part of that I made sure she’d have a desk that she could work at, and a place to put all of her various school and art supplies. 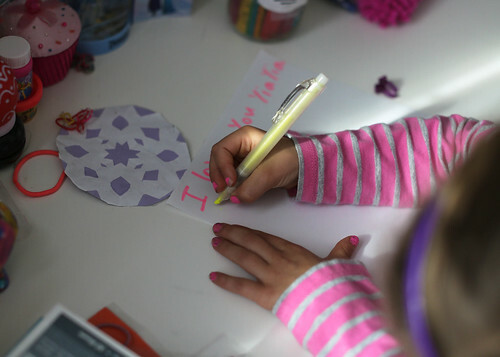 Yoobi is a school supply brand that we’ve piled high in Zoe’s arsenal. Not only do they make vibrant, cool products and have a long list of items, they also work within the buy one, give one model. For every Yoobi item purchased, Yoobi donates a Yoobi item to a classroom in need, right here in the U.S. Together with the Kids In Need Foundation and its affiliate network of resource centers, Yoobi aims to impact more than 30,000 classrooms nationwide by the end of the school year, changing the lives of over 750,000 kids. I’ve used this as a segue to a conversation with Zoe about how fortunate she is to get to go to school at all, and how we all think it’s incredibly important to give back to others. Instilling values is something that happens beyond a conversation, but approaching the topic at all is the first step. A conversation piece, so to speak. 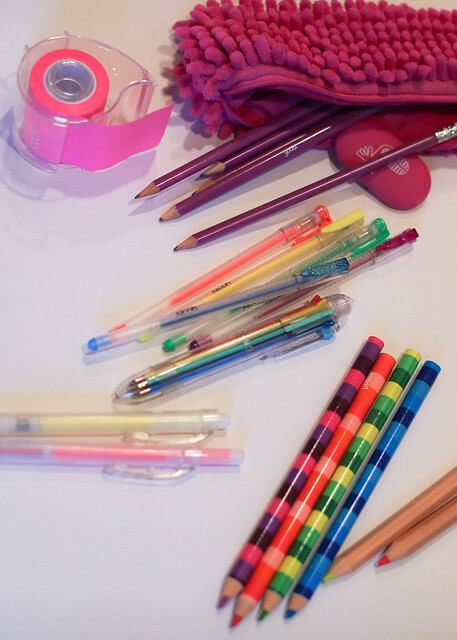 With these supplies, Zoe immediately began organizing. 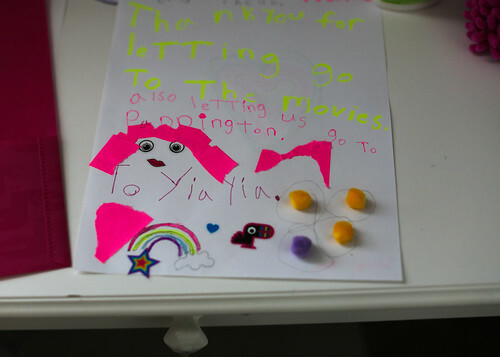 She put her favorites from the collection, the Color Your World pencils in the drawer, the Stick To it tape on the shelf, and the Luck Of The Draw crayons in a little jar that sits on top of her desk next to a picture from school. I know with her beautiful Virgo soul, being sorted and organized is a big part of her process, and I think that the bright colors really motivated her to get started. 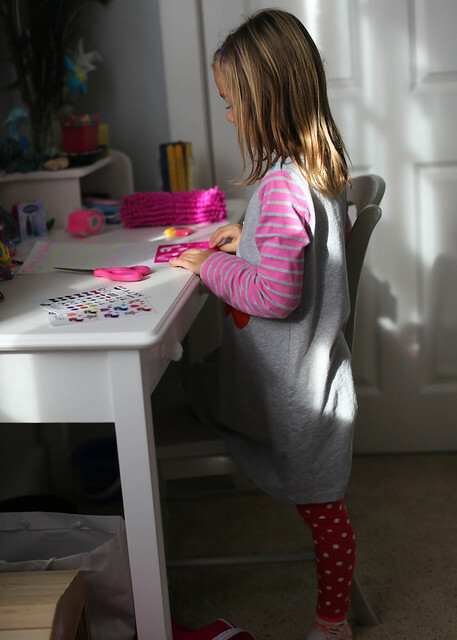 While the homework task seems to be an overall hiccup in our weekly routine, I can tell that she is drawn to her own creative, quiet space and outlet with the new fun supplies. 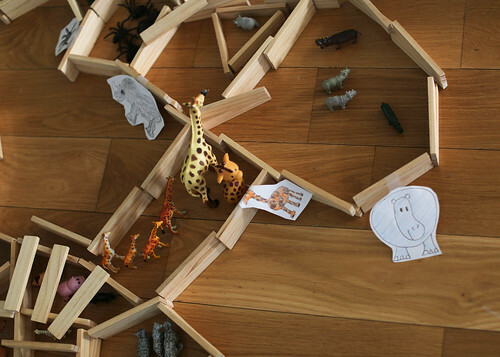 She eagerly built a zoo with hand-drawn animals, but that math sheet is still waiting for her completion. I’m much more inclined to purchase a product that has an overall mission to help those in need, and with Yoobi it was a win/win. 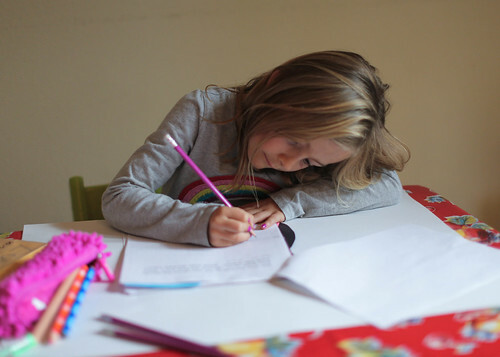 Learning about what makes my children tick and how to manage it effectively is one step in the parenting process that I hadn’t anticipated being so challenging, but it’s a delightful challenge and one that I’m happy to accept. Thank you to Yoobi for sponsoring this post, and thank you for reading! 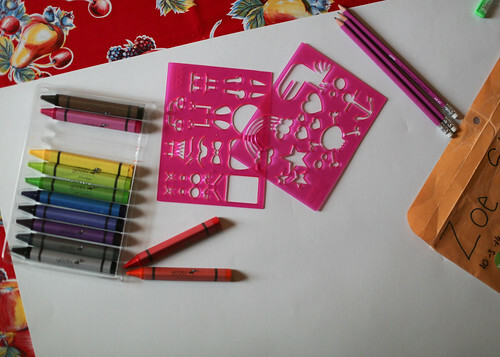 I love fun school supplies still! It was the best part of going back to school every year– even as a teacher! Good to know about a company that gives back! I love that idea, thank you! Her animals are beautiful. So glad you are nurturing that talent! Where did you get the zoo toys? My niece NEEDs to have these! 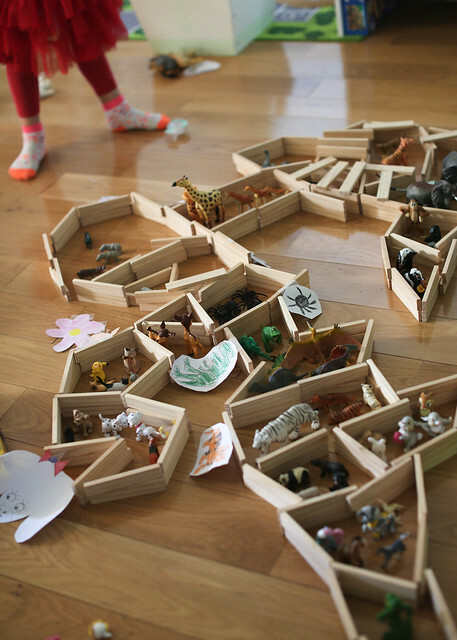 She loves animals and often pretends there is a zoo in her house. Loved this blog. My 2 boys couldn’t be more different. My second kid sounds like your Zoe. He is not a lover of homework. Now that he is a freshman in high school it is truly stressful with the homework . Your Jack sounds like my first kid. He breezy’s through school. On a side note. I follow your Instagram and it seems like you have to tag everything in your pic because people are always so interested in where to buy the clothes . Gets really irritating with the same questions . Maybe that IG liketoknowit you’ll have to try. Just a thought.